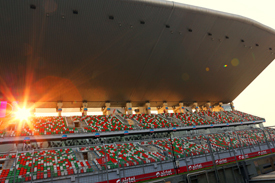 05:25 Hello and welcome back to AUTOSPORT Live as we continue coverage of the 2013 Indian Grand Prix. Champion-elect Sebastian Vettel set the pace in both sessions of practice on Friday, with Red Bull looking to hold the advantage once again going into the weekend. This final hour of practice will give the teams a last chance to evaluate the two tyre compounds and make final adjustments to the now race-prepared machines. 05:26 It remains dry and warm at the Buddh circuit, with the only weather feature of note being a slight haze to the sunshine. Temperatures could again reach 30 Celsius. 05:28 Pirelli's soft and medium rubber make up the allocation here this year, with the choices being softer than previous events at this circuit. 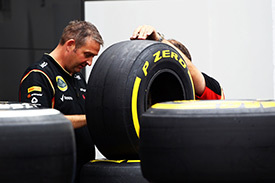 Drivers found the medium rubber to be an ideal race tyre, giving plenty of consistent pace over a large number of laps. But the soft tyres do look to be a challenge, at least with the track conditions experienced on Friday afternoon. While giving an obvious performance boost, drivers struggled to keep the soft rubber alive, with the left front in particular subject to graining. Outfits may bring forward the typical pre-qualifying evaluation of the soft in this session to run further laps of race preparation. 05:29 Race control has announced a delay to the start of the session, which will now begin at 11:15 local time. 05:29 The delay is due to "visibility problems"
05:30 A further bulletin states that the session has been shortened to 45 minutes. 05:31 Pic asks "I can jump out?" He's told that's OK and he'll be needed at 10-past the hour. 05:33 Conditions are hazy out there, with the concern as ever likely to be flight conditions for the medical helicopters. 05:35 Plenty of standing around going on in the garages, with teams waiting for further news on the start of the session. 05:37 Typically the start of final practice is quite leisurely, so this will not have a major impact on the engineers' plans for the morning. 05:39 However, there appears to be little change in the visibility at the moment, so there is potential for the delay to be extended. 05:40 The session has been delayed by a further 15 minutes. 05:41 That announcement has been explained with the message that the medical helicopter cannot operate due to the poor visibility. 05:43 A session start of 11:20 local time has now been suggested to the teams. 05:45 That makes the green light now five minutes away, with teams springing into action to ready the cars and drivers. 05:46 Nico Rosberg is in his Mercedes and raring to go and team-mate Lewis Hamilton will soon be in a similar position. 05:48 With the session start imminent, the track temperature is 35 degrees, with an air temperature of 28. 05:49 Sebastian Vettel is ready and raring to go in the Red Bull. 0 min: Green light and finally the session is go at Buddh. 0 min: This is likely to be a busy start to the 40-minute session, with teams adjusting the run plans to get plenty evaluation in. 0 min: Mark Webber performs a practice start at the end of the pitlane. His Red Bull replacement Daniel Ricciardo passes him and joins the track. 1 min: Bottas and Hamilton are also out swiftly, as is Rosberg in the second Mercedes. All are fitted with medium tyres. 1 min: Many drivers on circuit already, with teams needing to check the overnight re-build of the cars to install race engines and gearboxes. 2 min: Medium rubber all round for the moment, but engineers will be keen to get in a decent test of the apparently fragile soft tyres. 2 min: Ricciardo opts to pit, this was just an installation lap, but Webber and Vergne continue round for a second run. 3 min: Hamilton brings his Mercedes back into the garage, as does Rosberg. 3 min: Gutierrez is straight into a run with his Sauber, setting the initial time at 1m30.709s. 3 min: Webber lowers the early benchmark, which is now a 1m27.879s. 5 min: Bottas and Vergne filter in behind Webber after their first runs. 5 min: Even the Ferraris are on circuit at the moment, with this point in a full hour session being the time they typically join the action anyway. 6 min: Alonso completes his first lap in 1m27.792s and goes straight to the top of the times. 6 min: Webber improves second time around though and retakes top spot with a 1m27.180s. 7 min: Massa is up to fourth fastest with an early effort in his Ferrari, with Gutierrez now fifth. 7 min: Hulkenberg tops the first sector time as he goes fifth fastest for Sauber in these early times. 8 min: Hamilton is back out, and on the timesheets in an initial 15th - last of those to set a time. He jumps to ninth on his second effort. 8 min: Rosberg pops up into second with a 1m27.791s. 9 min: Massa springs up to second fastest with his latest effort, despite a wobble around the back of the circuit. 9 min: Session pace-setter Webber brings his Red Bull into the pits after his four-lap run. 9 min: Alonso pips his team-mate to that second spot, just fractions off Webber's benchmark now. 10 min: Gutierrez asks if he can go “minus 2” steps on his front wing if he’s got time. He’s told he can have two more laps if he pits now. 10 min: Sutil has a bit of a moment on his way to 10th overall. He's one tenth and two places up on his team-mate di Resta. 11 min: Ricciardo's pumping in the laps on a longer run for Toro Rosso. He's last at present, that seventh lap yielded a 1m32.709s. 11 min: Hamilton's up to fourth now, improving to a 1m27.289s. 11 min: Button is now up to fifth fastest in his McLaren. 12 min: That puts Hamilton all of 0.004s ahead of team-mate Rosberg. 12 min: But Perez takes over the leading time for now with the fastest first sector. 1m27.136s is now the time to beat. 12 min: While his team-mate does some longer running, Vergne gets straight down to business. He's eighth, on a 1m27.445s. 13 min: Improvements for di Resta and Maldonado, who are running a few hundred metres apart on track. They are ninth and 12 respectively. 14 min: Vettel, fitted with the soft tyre, leaps to the top of the times. It's a 1m25.332s. 15 min: Alonso is best-of-the-rest at the moment on medium tyres, some 1.6 seconds off the soft-shod Red Bull. 15 min: Webber is also back out and his Red Bull has some soft boots fitted too. 15 min: Di Resta is suffering vibration from both axles: “Do you think everything’s OK with the brakes?” He’s told they’ll look into it. 15 min: Ricciardo long-run update: The Aussie has now completed 10 laps, the last of which a 1m33.469s. 16 min: Massa is now on soft rubber as well, with this concern over durability forcing outfits to put in a more extensive test of the option tyres. 17 min: Sutil and Maldonado improve further, and now their position on the timesheets matches their position on track - Sutil fractionally ahead in 11th. 17 min: Grosjean clocks 1m27.091s on medium compound, currently sixth fastest. 17 min: Webber's first run on the softs gets him up behind his team-mate, though he's more than half a second back on a 1m25.892s. 18 min: Raikkonen, meanwhile, is up to third on medium compound. 19 min: Massa clocks 1m26.435s on soft rubber, but that's 1.1 seconds slower than the Red Bull pair. 20 min: A nasty moment in the Sauber pits though recently, with a mechanic clipped by Hulkenberg coming into the pits. He has hobbled away, to the attention of medics. 21 min: Despite a spin, Chilton reports his balance is "better than yesterday, but front-end is still lacking initially. The rear is starting to drift more." 21 min: Massa, out there to experiment on soft rubber for Ferrari, is now pushing again after a lap to cool the rubber. 21 min: Hamilton and Rosberg are back out again after spells of varying length in the pits. Both remain on the medium tyre. 23 min: Massa pits at the end of his third lap on the softs, typical of Ferrari's regular drive-through approach. He's back on track again. 23 min: Ricciardo finally calls it quits on this run after 14 laps. He looked steady in the low-1m32s. 23 min: Pic reports his Caterham is "feeling normal again, compared to yesterday. I'm quite happy about the balance." 24 min: As Ricciardo pits, his team-mate Vergne improves. The Frenchman slots in 14th on a 1m27.398s. 25 min: Big moment for Gutierrez over the kerbs, launching the Sauber into the air. He has continued, perhaps a little shaken by the hefty landing. 26 min: Vettel, on the soft tyres, is out again. Their qualifying set-up looks sorted - this will be a longer run to sort out their graining issues. 26 min: Gutierrez is told his aero data looks OK.
26 min: Webber follows suit and rejoins the action with soft tyres fitted. 26 min: Grosjean now has soft tyres on his Lotus for a more regular pre-qualifying blast. 27 min: Rosberg jumps to sixth on a 1m26.932s, his sixth lap of this run and 13th in total on that tyre. 27 min: Hamilton says "I'm doing another lap" but is told "I suggest you box, box." He pits. 27 min: Vettel's first flying lap is a high 1m31s. The drop-off is what Red Bull will be looking for. 28 min: Alonso heads out for a qualifying simulation on softs, while Massa is planning a long-run test of the troublesome tyres. 28 min: Sutil in 13th rejoins with soft tyres fitted to his Force India. 29 min: The second lap for Vettel yields a mid-1m31s, while Webber crosses the line in 1m30.999s for his first effort on his respective run. 29 min: More drivers heading out now on softs, expect changes to the timesheet shortly. 30 min: Vettel drops off a second on the third lap, 1m32.6s, and is a chunk slower than Webber in the first sector on the fourth. 31 min: Raikkonen clocks 1m26.635s to go fourth fastest, but that's also a second off the pace. 31 min: Sutil jumps to fifth on those aforementioned soft tyres, a 1m26.847s for the German. 31 min: Alonso does 1m26.105s on softs, going third. That's seven tenths off the Vettel benchmark. 31 min: Webber's second effort is a second slower than his first; a high 1m31s. Vettel, though, is now in the 1m34s. 32 min: Hulkenberg sets a great 1m26.306s on his softs, taking fourth fastest. 32 min: di Resta joins his team-mate in enjoying the soft tyre and goes sixth. Suil has since been shuffled back to eighth. 33 min: Alonso is told: “We do continuous laps on the soft” until the end of the session. 33 min: Webber's had a moment of some description and is a couple of seconds off, and now he pits. That was only seven laps, outlaps/inlap included. 33 min: Grosjean sets a 1m26.350s on softs, that's fifth fastest. 34 min: Vettel continues to pound round, though, He remains in the 1m34s for now, 10 laps on those tyres now. 34 min: Maldonado off track at Turn 12. He continues. 34 min: Despite that, Maldonado improes to ninth on a 1m26.641s. The Williams has been quite nimble around the Buddh circuit thus far. 35 min: Hulkenberg is pushing his soft rubber now, but has relatively low fuel in his Sauber at the moment. 35 min: Bottas underlines that by going 11th, with a time of 1m26.883s. 35 min: The two Mercedes' are back out and on soft tyres for the first time this session. 36 min: Still Vettel remains in the 1m34s. That's a good three seconds a lap slower than he was managing on the mediums in FP2. 36 min: Hulkenberg clocks a 1m35s on softs as he complains about the rear tyres on his Sauber. 37 min: di Resta is the only car in the pits at the moment. It's very busy in the final minutes of the session. 37 min: Maldonado has another off track moment, but continues unperturbed nonetheless. 38 min: Hamilton's not happy. He has to take to the outskirts of the track at Turn 12 to navigate Grosjean's Lotus. 38 min: Plenty of drivers still running on the soft tyres after the qualifying simulation, with teams very keen to measure the tyre life. 39 min: Button finally sets his best time of the session, going ninth after four laps on his soft tyres. 39 min: Hamilton may feel aggrieved, but it looks as though Grosjean was recovering from his own moment. 40 min: That's the flag on a 40-minute final practice in India. 06:30 Hamilton does now get a proper soft tyre run in undeterred, but it's only a 1m26.557s and good enough for 10th. 06:30 The other Mercedes of Rosberg goes eighth on a 1m26.441s. 06:31 Vettel ends his mammoth run on the soft tyres - 12 now, 15 in total - in the 1m33s and then a very low 1m34s. Impressive. 06:32 Alonso completes his final lap in 1m32s, with heavily grained tyres on that Ferrari. Massa has been circulating in low 1m33s. 06:32 Alonso was on relatively low fuel after his qualifying simulation, while Massa likely tanked up for that run to the flag. 06:32 Vettel and Red Bull continue where they left off on Friday, comfortably clear in first and second. 06:33 Alonso and Hulkenberg showed well for Ferrari and Sauber in third and fourth, but the former will be unhappy with the 0.8s soft tyre deficit. 06:34 With the fifth fastest time, Grosjean underlines his recent impressive form ahead of Massa, while a strong showing from di Resta clinches seventh. 06:34 Rosberg, Button and Hamilton round out the top 10 - but the latter will be unhappy not to get a fresh soft-tyre run in at the end. 06:35 Still, though, Vettel looks untouchable. Join us for qualifying to see if anyone can beat Red Bull's triple world champion to pole.